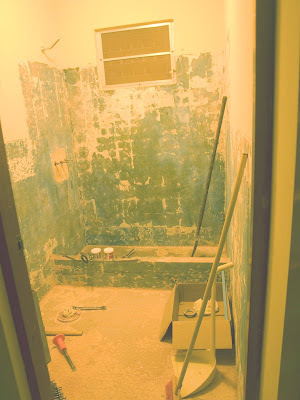 The Kruse Chronicles Continue in New Mexico: Bathroom Progess - Muy Rapido! Day one involved demo of a majority of the bathroom. 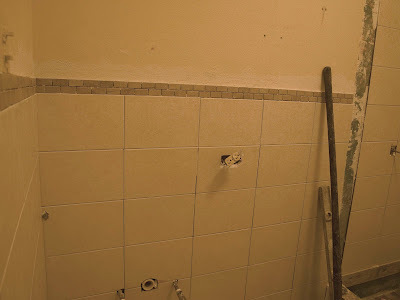 Carlos showed up at 7:10 and stayed until around 1:30 chipping away at the old tile. 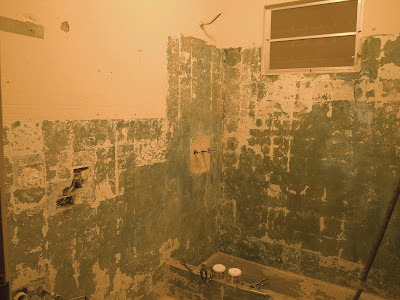 He got most of the walls and the front floor done, and the floor in the shower was waiting for the next day. He showed up around 7:30 (his mother dropped him off) and chipped away at the rest and hauled the basura to the truck so I could take it to the dump (about 8 minutes away). I was pretty pleased that it went that fast, as fast as I thought it should, and was happy he showed up pretty much on time and worked the whole time. He didn't want a sandwich for lunch so he just had water occasionally. So now it is Tuesday and Jeff hasn't replaced the really old valve assemblies for the three shower knobs. We aren't changing locations of anything so he needed to replace the stems before the tile went up and who knows what the thingys are called. This is not something I could do. I went to HBQ plumbing or whatever it is called to get replacements but of course only Spanish speakers were there, my photos didn't show sizes, and they needed me to hand them the old ones so I could get new ones. I went home, turned off the water (keep in mind I am filthy from having just shoveled tile out of the truck into the dump) and gave it my all the get that stem out. It was bending a little, I couldn't turn it, everything was old and corroded and too difficult for me. So I tried to turn it the teeny way back....turned on the water....and water came shooting out of the top shower pipe into the gutted bathroom! Not good. I turned the water off. It is only 2:30. Jeff gets home around 6:45 and I am soooo filthy I just can't stand another minute of filthy tile dust . I can't turn on the water without it squirting full force into the bathroom. I call the neighbor and shower at her house (thanks Awilda!). Jeff gets home and happily can get it so we have water at night. The saga doesn't end. I make him take the day off so he can fix this because the guy is tiling the wall today. The problem is that they are coming at 7, they need water for thinset and HBQ doesn't open until 8. The water has to be off once he removes the parts. So I fill up buckets of water, tell the guys there is una problema poquito hasta mi esposo volver - no aqua. It is fine and they start putting the guide board up so they can start tiling. Until now there has been only 2 days of Carlos. Today Roberto joined him. Roberto joined Carlos for the tiling event. He mixed the thinset and helped put the guide board up. Let the tiling begin! Meanwhile Jeff has returned with the faucet hardware and put it in and it was in before the guys got to that point. Hooray! I decide to leave Jeff to get the glass blocks for the wall. I head out and as I am almost home call to see if they started the trim. They have. Despite my explaining (to the spouse and tilers) that I wanted the trim 2 tiles high I arrive and it is going up 3 tiles high - uhh uhh. Quiero dos. Off it comes and I get what I want (I thought about this - trim is mainly a line for your eye that has a little more interest than nothing. Three high made you focus on it). So here's one wall with trim. I am not doing trim on the vertical part because it would look weird on the glass block side, looks goofy and is distracting. I want super simple and clean looking! I think it looks great (Jeff would rather the trim go vertical there = he thinks it looks unfinished)! Another little glitch was that I had set aside 6 tiles with a little corner chip in them - set them aside as ones to use when they had to cut tiles. Somehow 2 of them ended up on the wall and were taken down and unchipped ones put in their place - hey, this is the last time we do this bathroom! Jeff didn't notice the chipped corners, the guys didn't notice. Come on...in 2 seconds my eye spotted them! 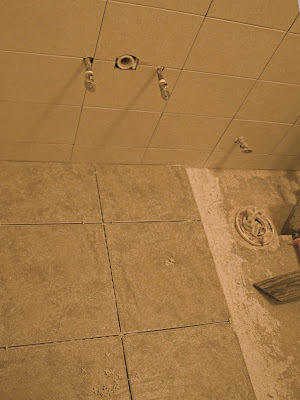 Yeah grout would make it disappear a little more but hey, there is plenty of tile! 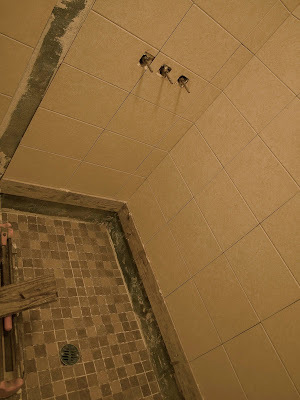 They did the tiles in the shower area. I made things super simple for them by getting sheets of 2x2s so there was less to line up and they wouldn't need spacers. All my choices were made with tile size in mind so there would be less cutting involved and things would more likely be level and more evenly spaced. The empty strip is going to have cut tiles in it tomorrow and then the glass wall will be anchored into it. Very few tiles needed to be cut. Tomorrow the cut tiles along the floor will be put in and the main floor. I think it will be a short day. They aren't working Friday, but Monday should be a grouting day and maybe anchoring the hardware for the glass wall. I think Tuesday will be the wall, with Wednesday as a touch up, towel bar, finish the wall day. It is going fast! 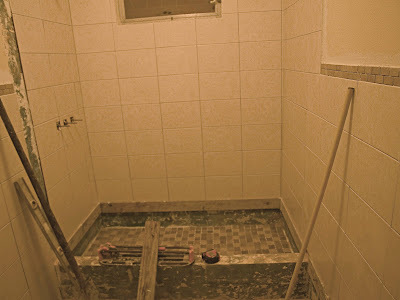 Do you think it's possible to have a new bathroom by xmas? Right now there are crystal blocks and towel bars under the tree - that's what I am hoping for....then it will be the other bathroom. So so far it is going extremely well I think. After watching and hearing about neighbors having workers not show up, not call, or come at 3 pm instead of 8 I was dreading this. Unless tiles fall off the walls I am pretty darned pleased! I did think about the design so a maximum of whole tiles could be used (for cleaning purposes and installation purposes) but I didn't really think he would show up consistently....but he has. Oh lucky day... he appears to know what he is doing and he comes on time and does it! Yeah! Looks good, huh? 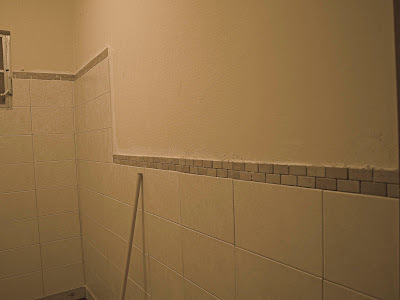 They still need to tile the little wall, do the bottom perimeter which requires cut tiles and finish the floor. Here's where the sink goes. This is the sink area and you can see some of the floor has been put down and yes...I did buy spacers for that! Toilet goes on the right. I don't want metal towel bars and stuff since even stainless rusts here. I could only find two styles of porcelin towel bars and I'm not crazy about them but even on the internet it is all metal. So I got an 18 inch for in the shower to hang bathing suits on and a 2 footer for the outside wall. The toilet roll holder is brushed nickel to match the towel bars on the sink and have a low profile. I'm happy with these (once the towels are on there you won't see them anyway. I'm thinking about painting -believe it or not - a pretty bluish, tuqoisish green and getting some dark blue towels.This is hysterical since I couldn't stand all the different blue tiles and now I'm thinking blue? Maybe I'll do a light yellow orange and put orange towels in there - that'd go well with beige. Hmmm, wild purple towels with lavender walls>=? (too girly). The options are endless and all towel color based. Guess it is towel time.